The built-in metronome uses a rhythmic beeping sound to help students achieve the correct rate of compressions while administering CPR. This is a TRAINING DEVICE ONLY, NO SHOCK DELIVERED. Item BG114 (Duffel Bag/Carrying Case) that can accommodate up to 6 AED Trainers is available for sale as a separate product here. AED Trainer with Multi-Language USB Port & Metronome is rated 2.8 out of 5 by 19. Rated 5 out of 5 by dtchem1 from Nice features, nice case Purchased some additional AED trainers to supplement for extra students. They are very nice, easy to use for students, multi language helps some students. It is nice that they come with a case. Rated 5 out of 5 by Butch9622 from great help in the classroom, so real the AED Trainer was everything I had hoped it would be. Rated 1 out of 5 by Bryson from Broken within a year Our facility used these last year and worked fine, but this year they all broke. The audio failed to work. We weren't rough with them and even stored them nicely. The price of these for the quality given is simply ridiculous. Red Cross please help us out. Rated 1 out of 5 by Mitchell A from Horrible quality and short lifespan! I purchased four of these as part of a larger kit in August. Within two months and only 3 hours of usage, one device no longer worked. As of today, two sets of pads are unusable, one connector is broken, two devices don't function, and a third of the four devices does not function properly. Rated 1 out of 5 by Lisa Volunteer from Cheap Students joke about how this AED Trainer looks like a Fischer-Price or Playskool toy. 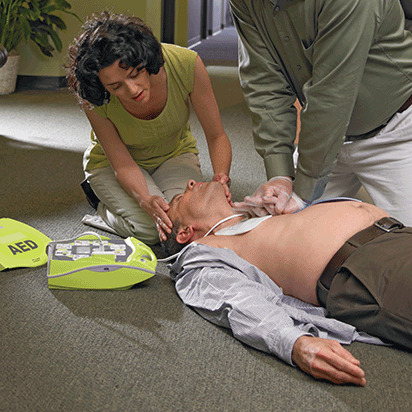 It does not resemble any modern AED seen in public locations. This recent AED trainers were part of an exchange because the two bought just 7 months ago stopped functioning and the AED pads wires broke off on the first usage and were held together with duct tape. Rated 5 out of 5 by kimmie M from Administrative Assistant This AED machine was purchased for our facility and we are so glad we did.